Nan is fast increasing in popularity as a tourist destination. The province stretches from near the Golden Triangle in the north for a considerable distance along the Laotian border. Until the 1930s it was a semi-independent kingdom, ruled by the same family for many centuries. With the death of the 64th Lord of Nan, Bangkok took control and it became a normal province of Thailand, but remained rather isolated from the rest of the country and little developed until the 1970s. - The small but well looked after historic city centre. 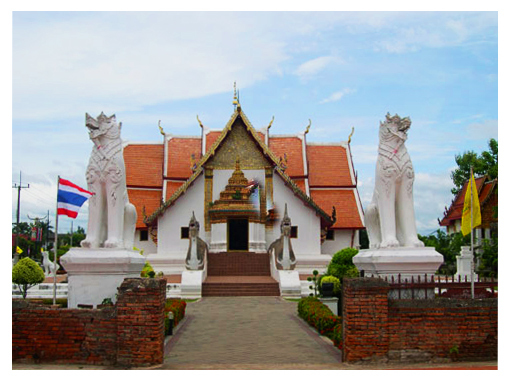 Best known here is Wat Phumin, a charming temple famous for its 19th century murals of everyday life. Other temples in the area and the Nan National Museum are also well worth visiting. - The House of Chao Fongkham. This is one of the best preserved large teak houses in Thailand, built in traditional Northern Thai style. This beautiful home is 150 years old. - Rafting down the Wa river. This crystal clear river runs through a beautiful unspoiled national park.